HOWARD SCHOLARSHIP. Officers from the Admissions and Aid Office of Xavier Ateneo, American philanthropist Henry Howard, and AFS Intercultural Programs Philippines president Princess Rahiema Bagis-Guerra share a group photo at the luncheon with the scholars. Supplied photo. 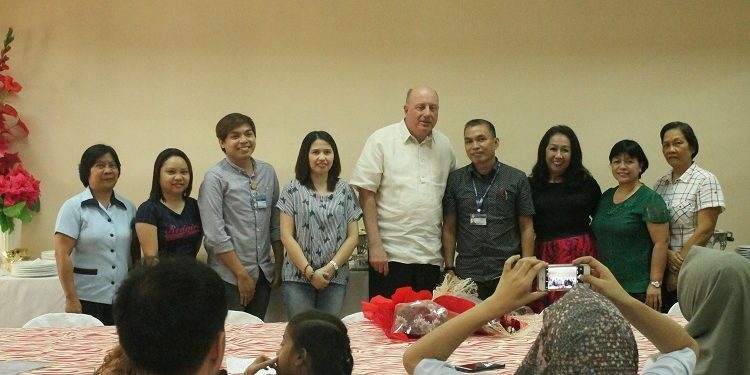 Cagayan de Oro, Philippines – In his recent visit to Xavier University – Ateneo de Cagayan, American businessman and philanthropist Henry B Howard graced the celebration of the 17th anniversary of his scholarship program named for his late parents — Henry H. Howard and Gertrude L Bagley. “This is our 17th year — we started in 2001 — and I am hopeful that we could go for another 17 years. 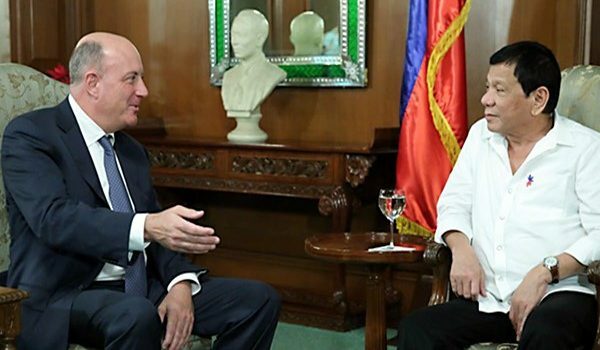 We will be doing this for a long time, into the future,” Howard said on March 1 at the Berchmann’s Refectory of XU. He also congratulated in advance the graduating scholars. ‎In his message, he recounted his days as an American Field Service (AFS) Intercultural Program student at Xavier University High School in 1974. LUNCHEON WITH THE SCHOLARS. 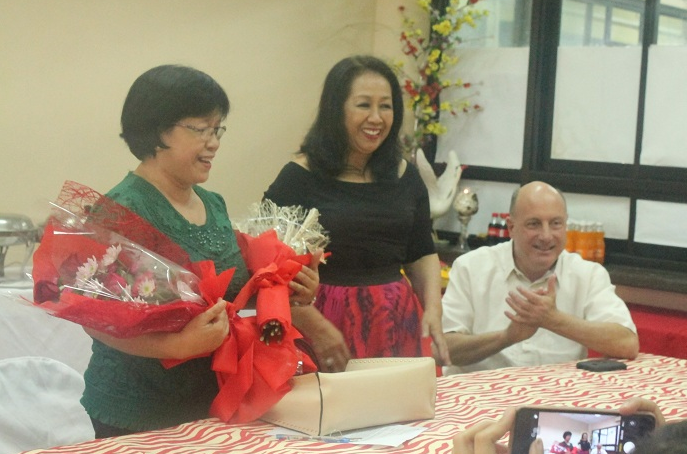 Pictured here are (from left to right) Emma Eduave of the Admissions and Aid Office (formerly known as the Office of Scholarships and Financial Aid), AFS Intercultural Programs Philippines president Princess Rahiema Bagis-Guerra, and AFS alumnus Henry B. Howard, during the luncheon with scholars and tribute to Eduave for being the “second mother of the Howard scholars” at Xavier Ateneo. 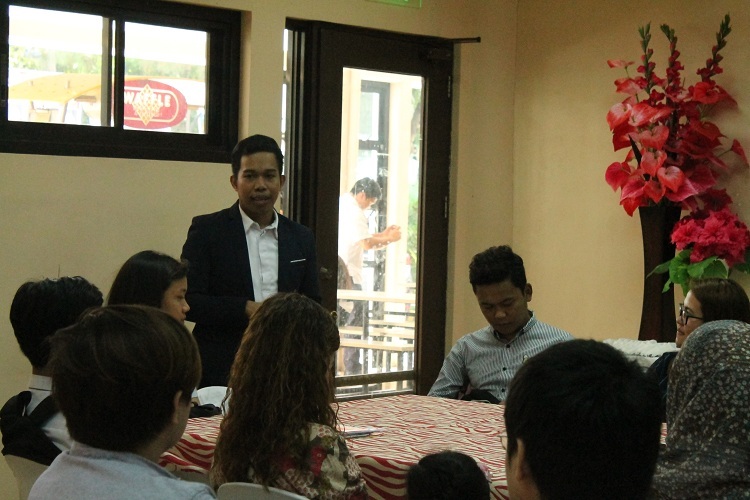 Since its establishment, the Howard Scholarship Program has supported more than 135 scholars from various parts of Mindanao coming from different religious and cultural backgrounds. “The scholar has to be from the poorest of the poor in Mindanao or Sulu. They must have no other way or financial resources to go to college. This is a scholarship program for them to get their bachelor’s degrees or even pursue master’s studies,” he said. At present, there are 22 Howard undergraduate scholars (16 of whom are graduating in March 2019) at Xavier Ateneo and one high school scholar. There are 12 incoming undergraduate scholars of the program and one medical student for SY 2018-2019, for a total of 13 new recipients.The scholarship covers full tuition, matriculation, board & lodging, books, uniforms, allowance, and a roundtrip bus or boat ticket once a year to go home to their provinces. “We also provide plane tickets and board & lodging to those who need to take a licensing exam (for example, becoming a Certified Public Accountant or CPA) in Manila or Cebu after graduation,” Howard added. Three of their former undergraduate scholars are also taking their respective master’s courses at Ateneo de Manila, Ateneo de Zamboanga, and University of the Philippines Diliman. Their tuition and school fees are partially covered by Howard. HENRY HOWARD SCHOLARS. At present, there are 22 Howard undergraduate scholars (16 of whom are graduating in March 2019) at Xavier Ateneo and one high school scholar. During the simple luncheon for the scholars on March 1, Howard was reunited with his high school classmate, historian Dr Antonio Montalvan, who will be writing a book on the history of the Howard Scholarship Program in Mindanao and Sulu. Howard didn’t miss the chance to tell the scholars to study hard and to be open to sharing with them how the program could further support their schooling, including their families. Howard went on to thank Emma Eduave of the Admissions and Aid Office (formerly known as the Office of Scholarships and Financial Aid) for being the point person, counselor, and disciplinarian of the scholars. Eduave is set to retire from Xavier Ateneo this summer. “All of this would not be possible without the hard work of Ma’am Emma who is always there for our scholars. Thank you so much,” he said. 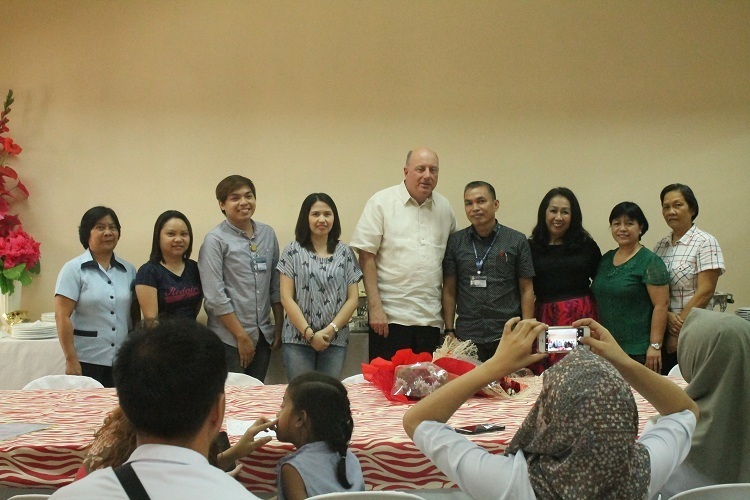 The management of the said program and selection of the scholars are done through the collaboration of AFS Intercultural Programs Philippines president Princess Rahiema Bagis-Guerra and the Scholarships Office of XU. The scholars also thanked their benefactor for his generosity and for being instrumental in reaching their dream of finishing college. “I would like to express my sincerest gratitude to the Howard Scholarship Program for assisting and supporting me throughout the four years of my college education. Being on the scholarship for four years made me realize how this scholarship is so generous to us,” said Blanche Bhernise Dungog, a Psychology senior. “I thank God for allowing me to meet these people with such benevolent hearts and may God bless them a hundred folds,” continued Dungog, a scholar from Zamboanga Sibugay. Benjamil Orishi Tibumbo from Cotabato City, who finished Nursing through the support of Howard, is set to take Medicine in the forthcoming school year under the same scholarship at the Xavier Ateneo Dr Jose P Rizal School of Medicine. 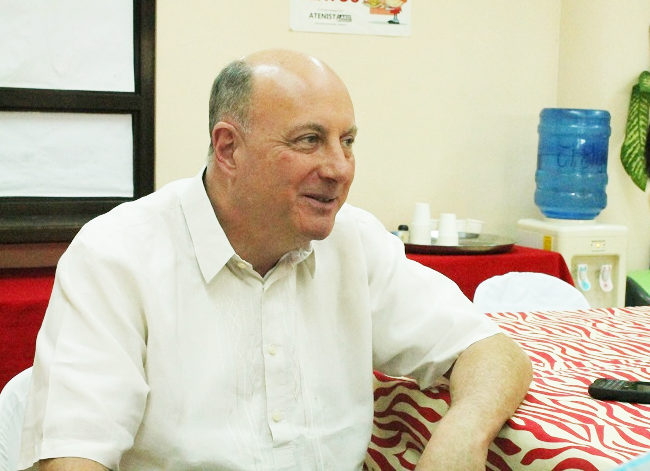 As his parting words, Howard encouraged the scholars to pay it forward in the future: “Later on when you are successful in your own careers and doing well financially, I expect you to give back to the society by sponsoring one student from Mindanao at Xavier University in the same way you are being sponsored today.” Howard is the founder and owner of the US Education Finance Group (USEFG) and the US Mortgage Finance Group (USMFG). HOWARD SCHOLARSHIP. Officers from the Admissions and Aid Office of Xavier Ateneo, American philanthropist Henry Howard, and AFS Intercultural Programs Philippines president Princess Rahiema Bagis-Guerra share a group photo at the luncheon with the scholars. Presentation of "Explore Islands Philippines in May 2018"